Turkish President Recep Erdogan projected to win reelection with 52.8% of the vote. Turkish President Recep Tayyip Erdogan has won reelection Sunday, with a projected 52.8% of the vote after 95% of the ballots had been counted Sunday night. Erdogan’s primary opponent in Sunday’s election, Muharrem Ince, head of the center-left Republican People’s Party, had just 29.9% of the vote. If incumbent President Erdogan secures more than 50% of the vote after all the ballots are counted, he will avoid a run-off election in July. Erdogan, who previously served as Prime Minister, was first elected president in 2014 with 51.8% of the vote, defeating the right-wing Nationalist Movement Party’s Ekmeleddin Ihsanoglu. 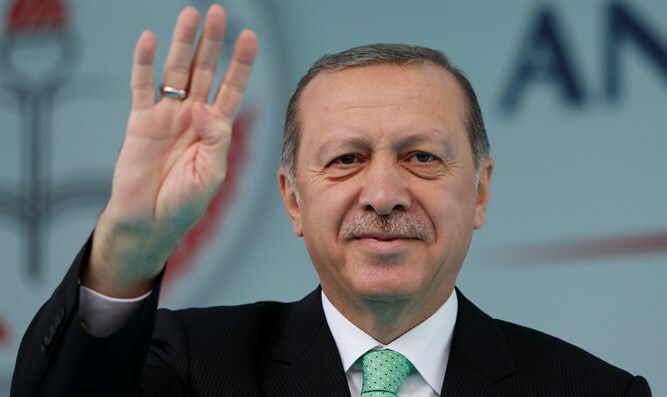 Despite his lead following after the closing of polling places Sunday evening, representatives from the Republican People’s Party initially refused to concede, noting that Erdogan’s lead had been shrinking as the vote-counting progressed, cutting his 57% projected share of the vote when 42% of the ballots had been counted. But by 10:45 p.m. Ankara time, Erdogan had declared victory, claiming a mandate from Turkish voters to continue as president. Erdogan, who leads the right-wing Justice and Development party, has since his election as Prime Minister staked out a bellicose anti-Israel position, freezing ties with the Jewish state after the Mavi Marmara incident in 2010, in which 10 Turkish militants were killed while attempting to run Israel’s security blockade of the Gaza Strip.